Time-traveling ride from Disneyland’s Past? Take a look at the photo above. The car has the classic body and trim of a Midget Autopia car at Disneyland—even the same grill and hood ornament—although this photo was not taken at Disneyland because the landscaping and track layout are completely different. 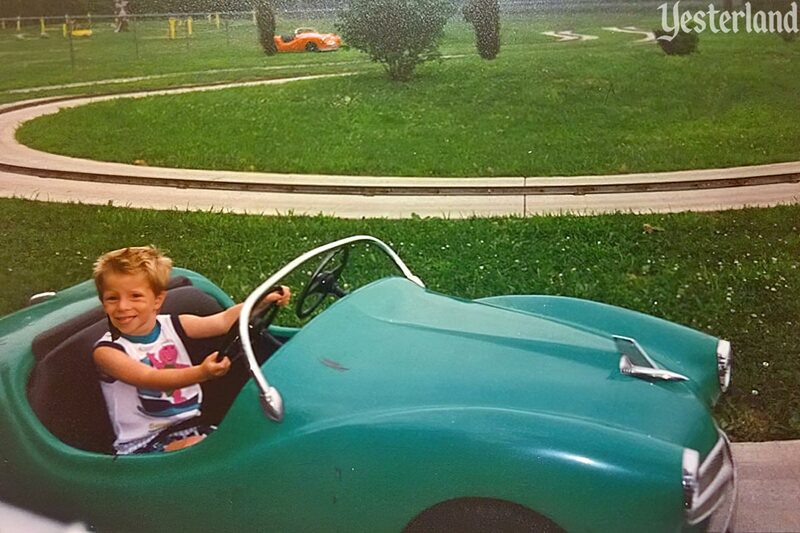 Scott Ladewig published the photo on his personal blog, wondering if the car might have come from the Midget Autopia. The photo is not from the time period of the Midget Autopia (1957-1966) either. Matthew Griffin, the boy in the photo, is wearing a shirt with Barney, the not-so-fierce, purple-and-green Tyrannosaurus rex from the 1990s hit PBS series Barney & Friends—a character not even conceived until 1987. According to Griffin, the photo is from 1993 or 1994 at Old Indiana Fun Park, a now-defunct amusement park near Indianapolis. How could a ride from the 1950s have been running in the 1990s? Where did it come from? What happened to it? What’s its relationship to Disneyland’s Midget Autopia? Let’s unravel these mysteries—and discover something even more amazing about this ride from the 1950s. Let’s start with a quick review of the history of Disneyland’s Midget Autopia. 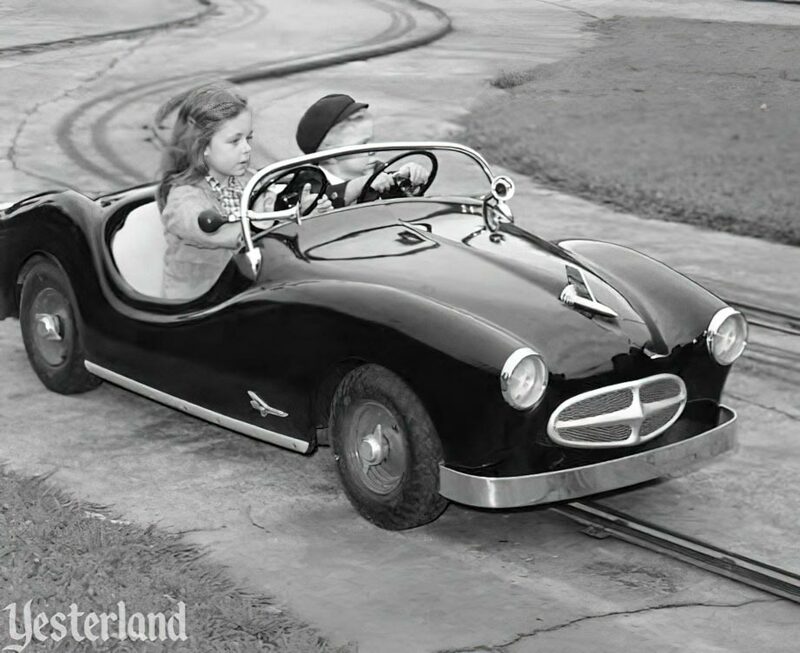 When it opened adjacent to the Storybook Land Canal Boats in 1957, the Midget Autopia joined the original Autopia (1955) in Tomorrowland and the Junior Autopia (1956) in Fantasyland. Now very young children could “drive” by themselves. The two steering wheels had nothing to do with steering the car. The cars were like Fantasyland dark ride vehicles, with electric motors drawing power from a center rail, which also guided the car along the track. The Midget Autopia operated at Disneyland until 1966. Walt Disney donated the ride—its ten cars, the center rails, and the expertise to build a new track—to Marceline, Missouri, his boyhood hometown. The ride operated in Marceline for a few summers, but it became too much for the small town to maintain the aging attraction. 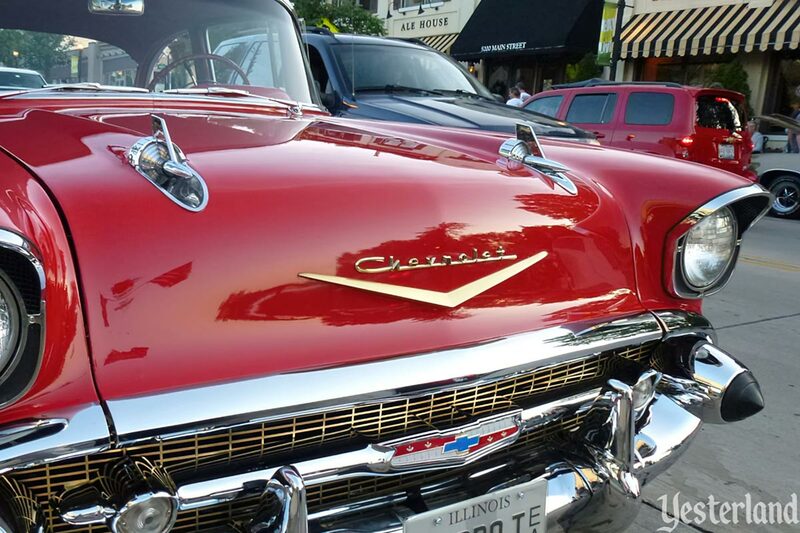 One car is now on display at Marceline’s Walt Disney Hometown Museum. Eight are in storage. 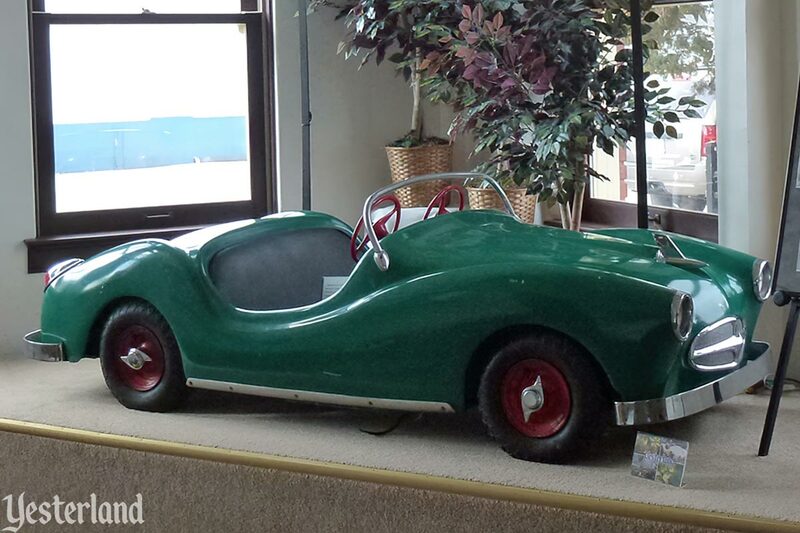 There are plans (but not yet funding) to build a new Midget Autopia in Marceline with new cars that mimic the original ones. 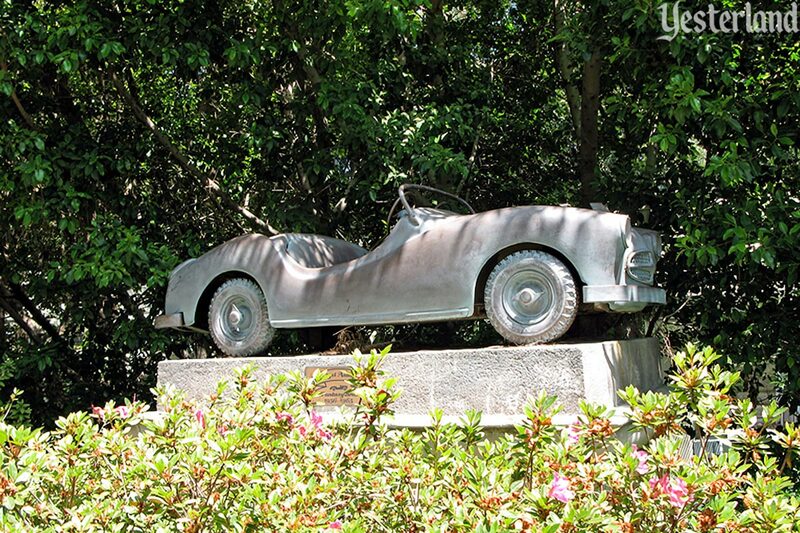 The tenth Midget Autopia car was bronzed in 2000 to become scenery along the route of the current Disneyland Autopia—homage to a mechanical attraction from long ago. That accounts for all ten Midget Autopia cars. And it’s been so long since the ride or any parts for it were manufactured, that it seems impossible that anything resembling Midget Autopia cars would have been operating in 1993 or 1994. Yet the photo at the top of this article tells a different story. Unlike the cars of the other two Autopias, those of the Midget Autopia were not custom-designed and built by Walt Disney’s WED Enterprises staff. Retired Imagineer and Disney Legend Bob Gurr has been quoted, “If it moves on wheels at Disneyland, I probably designed it.” The Midget Autopia is one reason that he had to include the qualifier probably. Any amusement park could buy the Arrowflite Freeway Ride from Arrow Development, an innovative ride company in Northern California. 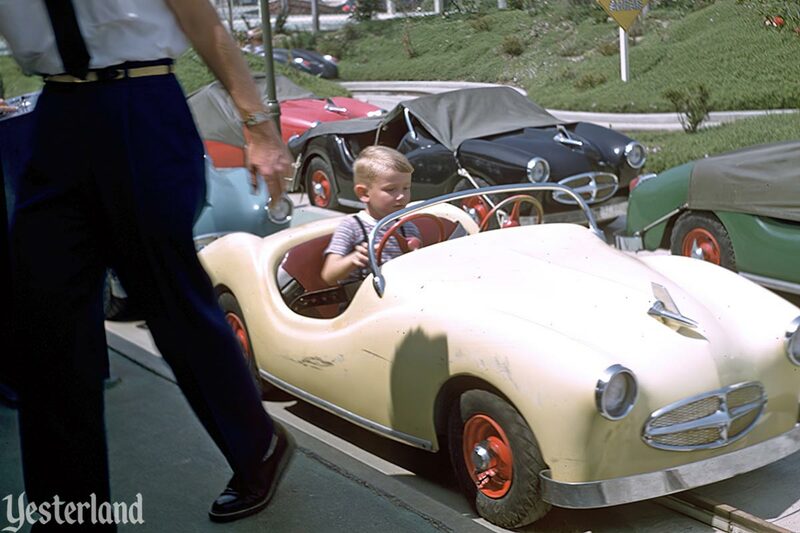 While the Midget Autopia ran at Disneyland, similar rides ran at amusement parks and even at shopping centers. In the advertising image above, notice that the hood ornament, grill, hood, and wheels are completely different than those of a Midget Autopia car. At first glance, the fiberglass body appears to be the same, but it’s different too. That just means there were different versions of the Arrowflite cars. Disney’s creative people designed the contoured landscaping and the track layout, including the track through the little yellow barn. But the cars were Arrowflite cars from Arrow. 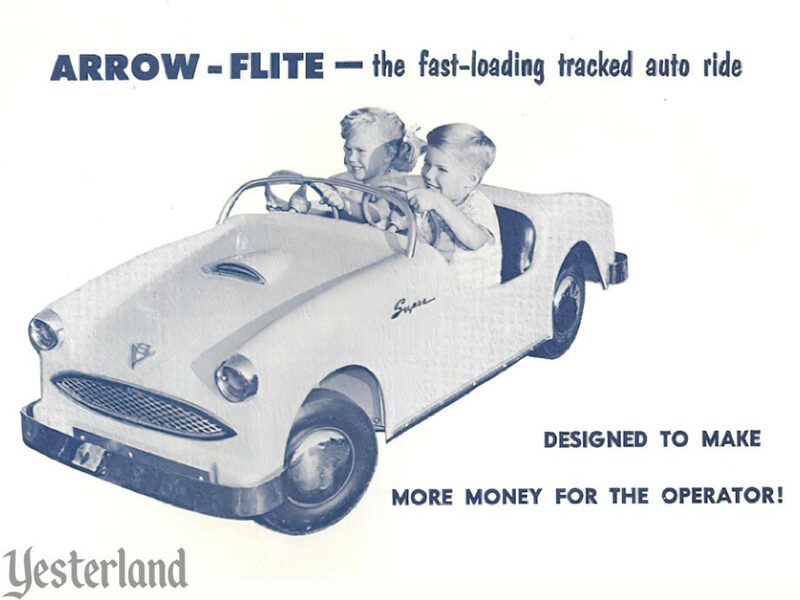 Dexter Francis, author of Building Disney’s Dream: Arrow Development – The Little Company that Could, has pointed out that the Arrowflite cars that were used for the Midget Autopia had a distinctive profile based on the Kaiser Darrin, an American sports car built by Kaiser Motors in 1954. The photo above shows a junior-sized Arrowflite car in 1964 with the same trim as at Disneyland—only this car is at Euclid Beach Park, an amusement park on the shore of Lake Erie near Cleveland, Ohio. Euclid Beach Park, which had opened in 1895, folded at the end of the summer season in 1969. Many of its attractions, including the Arrowflite cars, wound up 30 miles south at Shady Lake Park, which opened in 1978. Shady Lake Park only lasted until 1982. It was an opportunity for another park to pick up used rides. That park was Old Indiana Fun Park—where the photo at the top of this article was taken. At Old Indiana, the Arrowflite ride was called Kiddy Turnpike. The owners of Old Indiana Fun Park declared bankruptcy after a terrible train ride accident in 1996 left a 4-year-old girl paralyzed from the chest down and her 57-year-old grandmother dead. After being part of three amusement parks that failed—Euclid Beach, Shady Lake, and Old Indiana—these Arrowflite cars were almost 40 years old. Surely the ride was now at the end of its life. If the photo at the top of the article was surprising and amazing, what happened next is even more surprising and amazing. 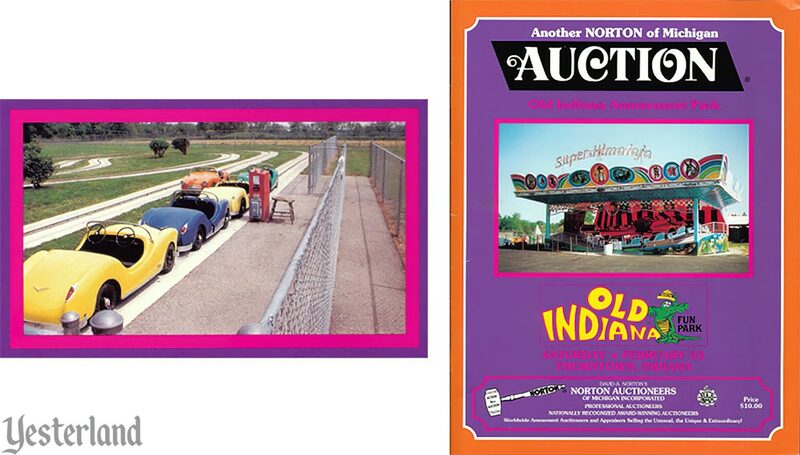 The rides from Old Indiana Fun Park were auctioned on February 22, 1997. Two new rides were introduced in 1998. 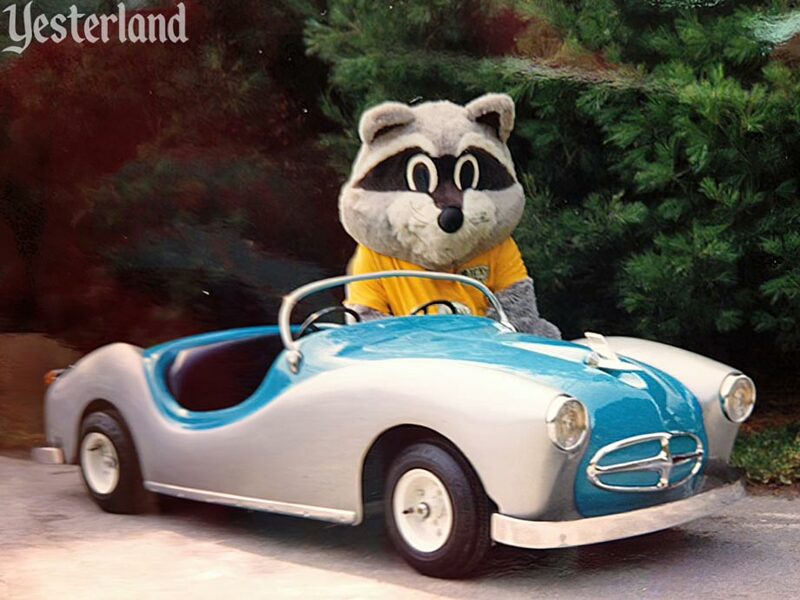 In Raccoon Lagoon [a section of the park], a lengthy automobile ride called Ricky’s Racers joined the lineup of Kiddie rides. Idlewild acquired the ride from Old Indiana, a defunct amusement park near Indianapolis and extensively remodeled it into an all-new attraction. That’s right. The former Kiddy Turnpike would become Ricky’s Racers. And this time, instead of being at a dying amusement park, it would be at a beloved family amusement park with a storied past and a bright future. It’s 20 years after the photo at the top of this article. It’s 50 years after the black-and-white Euclid Beach Park photo. 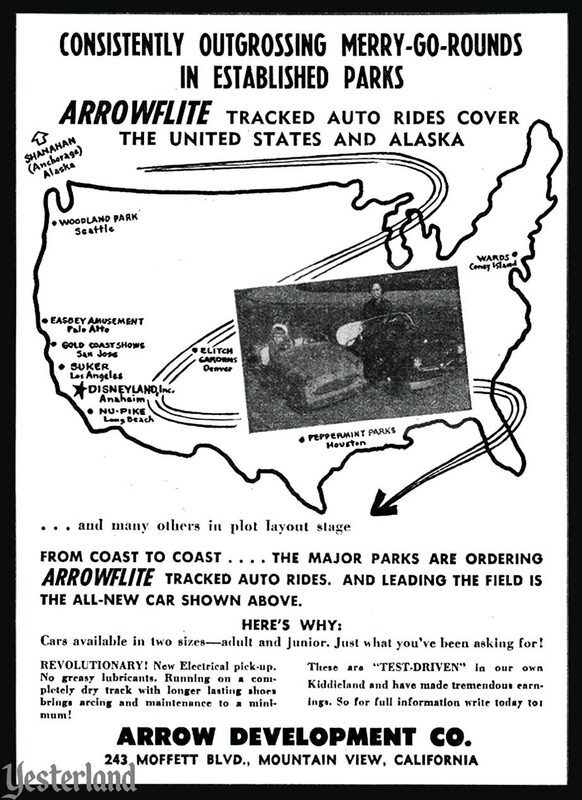 And it’s almost 60 years after the engineers at Arrow Development designed the Arrowflite Freeway ride. 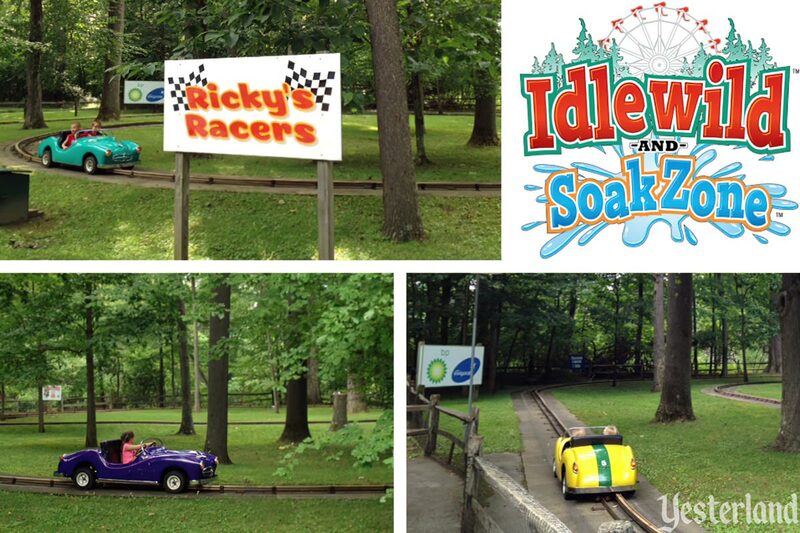 Ricky’s Racers is still going strong at Idlewild & SoakZone. The cars are beautiful. It’s amazing to see these gems from the past running in 2014 and looking great. 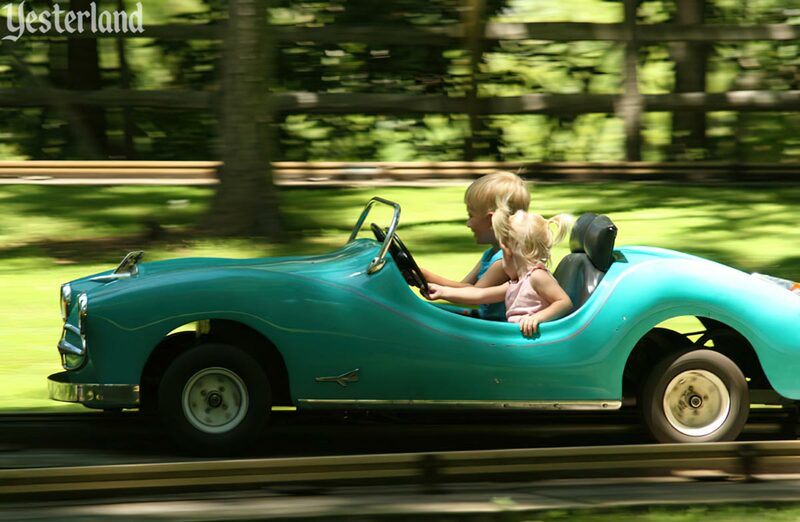 At first, it’s puzzling that amusement park cars could last so long—until you think about all the other classic attractions at a park such as Idlewild. Amusement park rides aren’t like kitchen appliances that you throw out when parts are discontinued. Idlewild traces its history back to May 1, 1878, making Idlewild & SoakZone the oldest amusement park in Pennsylvania and the third oldest operating amusement park in the United States. The park’s Merry-Go-Round, one of the last carousels built by the Philadelphia Toboggan Company in the 1920s, has been at its present spot at Idlewild since 1931. Idlewild has maintenance experts who lovingly and skillfully keep old and new attractions safe, fun, and looking great. That could mean making one-of-a-kind replacement parts in a machine shop. Perhaps there’s little left of the original cars beyond the sleek fiberglass bodies. The track gracefully winds between trees in a shady forest. 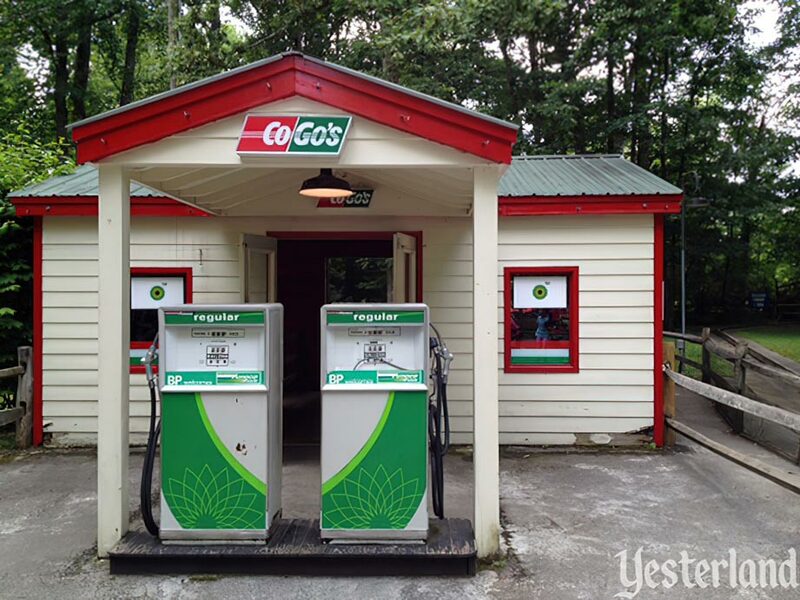 The cars still run on electricity—which makes the gas pumps adjacent to the ride somewhat incongruous. Thanks to Idlewild & SoakZone, children today can still enjoy a ride that their grandparents might have enjoyed when they were children. The Ricky’s Racers ride is probably the last operating Arrowflite Freeway Ride. What would make this story even more surprising and amazing if there were another ride with Arrowflite junior-sized cars operating somewhere else. Do you know of such a place?